Florine Stettheimer’s work circulated in the nineteen-teens and twenties around a wide variety of forgotten exhibition spaces in which fine art intermingled with commercial culture and domestic interiors were brought into public view. Stettheimer, a modernist painter, exhibited her work to her circle of well-known artists, writers, and critics in her carefully decorated, cellophane-and-lace-filled home and studio. Scholars have focused on this private form of display, yet archival records demonstrate that in this period Stettheimer also participated in a diverse array of public group exhibitions. These ranged from the landmark modernist museum show, the Exhibition of Paintings and Drawings Showing the Later Tendencies in Art at the Pennsylvania Academy of the Fine Arts, to the highly commercial Suggestions for the Decoration of the Fireplace at the Arts Guild Galleries.1 She also exhibited many times at a contemporary art gallery set within the two-story model house, Belmaison, in which Wanamaker’s New York department store displayed its most luxurious home furnishings.2 This gallery showed the work of many other well-known modernists, including Stuart Davis, Marsden Hartley, Charles Sheeler, Marguerite Zorach, and William Zorach. Fig. 1. Florine Stettheimer, Spring Sale at Bendel’s, 1921. Oil on canvas, 50 x 40 in. Philadelphia Museum of Art. Stettheimer not only brought modern art into the department store; she brought the department store into modern art. Her 1921 work, Spring Sale at Bendel’s (Philadelphia Museum of Art), pulls back the curtain on a whirl of bargain-hunting women who have temporarily transformed the first floor of this exclusive boutique into a joyful scramble (fig. 1). The wealthy Stettheimer, who regularly purchased couture garments, depicts this indecorous display of upper-middle-class consumer desire in a humorous style influenced by published and unpublished commercial illustrations. The following year, Spring Sale at Bendel’s itself circulated through another space of class-based negotiation. Stettheimer exhibited it among the so-called “freak creations” of both modernists and amateurs in the annual “no jury—no prizes” exhibition of the Society of Independent Artists at the Waldorf Astoria.3 There, it hung before what was perhaps the largest, most varied, and most potentially antagonistic audience of any show in New York City. Stettheimer’s career offers a uniquely productive case study through which to understand both the variable and overlapping spaces of modernism at this moment, and the distinctions that emerged within them. Tracing the movement of her works brings into view a variety of previously unexamined venues in which art and commerce converged. It also demonstrates that while the places and audiences Stettheimer encountered were interconnected, they were not interchangeable. Scholars often invoke the word “fluid” to describe the lack of rigid boundaries in the art world of this moment, with some positing a dynamic relationship between so-called high and low culture, and others drawing attention to a more inclusive modernism.4 Moving through these many individual locations, however, it becomes evident that while different classes of objects and people flowed through them, the resulting juxtapositions often served to expose subtle hierarchies inside. This essay reveals the previously overlooked diversity of Stettheimer’s exhibition practices, and argues that the period’s lack of rigid boundaries between art and commercial culture resulted in nuanced class and gender-based mingling and sorting, not democratic equivalence, within the spaces of early twentieth-century American modernism. Fig. 2. Peter A. Juley & Son, Interior of Stettheimer studio, New York City. Peter A. Juley & Son Collection, Smithsonian American Art Museum, Washington, D.C. Fig. 3. 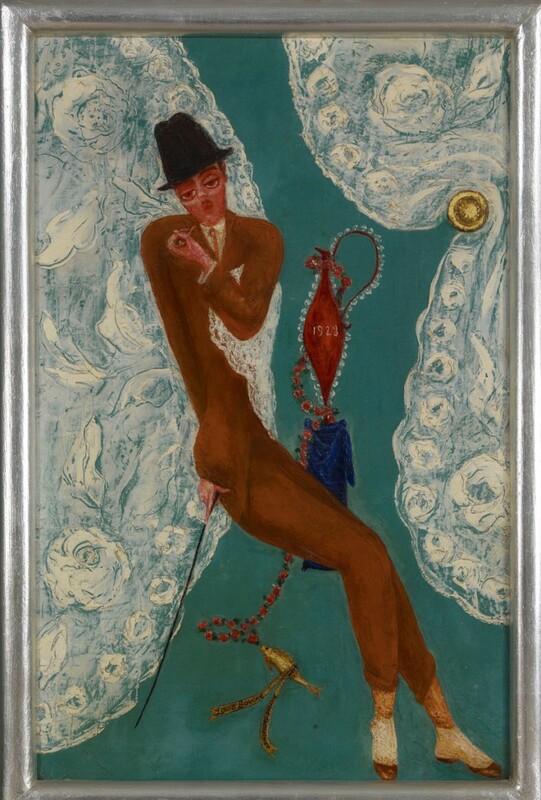 Florine Stettheimer, Portrait of Carl Van Vechten, 1922. Oil on canvas, 28 x 26 in. Yale Collection of American Literature, Beinecke Rare Book and Manuscript Library, Yale University, New Haven. In contrast to the robust scholarship on her domestic display, Stettheimer’s public exhibition history has never been the subject of sustained study. Examining this history reveals that, just as the spaces in which Stettheimer exhibited were more complex than previous scholarship acknowledges, so too were Stettheimer’s practices themselves. Until now, scholars have effectively sequestered Stettheimer at home by focusing almost exclusively on her private displays of her work and her circle of intimate friends.11 This is at least in part because she had only one solo show, early in her career, which resulted in no sales and mixed reviews. Thereafter, she presented her work in group exhibitions. The standard narrative is that she was so troubled by that early negative experience that she essentially withdrew her art from view.12 Yet the historical record tells a different story; between 1916 and 1926 Stettheimer frequently showed her work in public. Stettheimer’s one-person show took place in 1916 at the important New York gallery Knoedler & Company. It demonstrates that from the beginning, Stettheimer’s exhibition practices troubled the boundaries between private and public space, and between domesticity and commerce. In an upper room, Stettheimer displayed her paintings in a replica of the most private spaces of her own home. 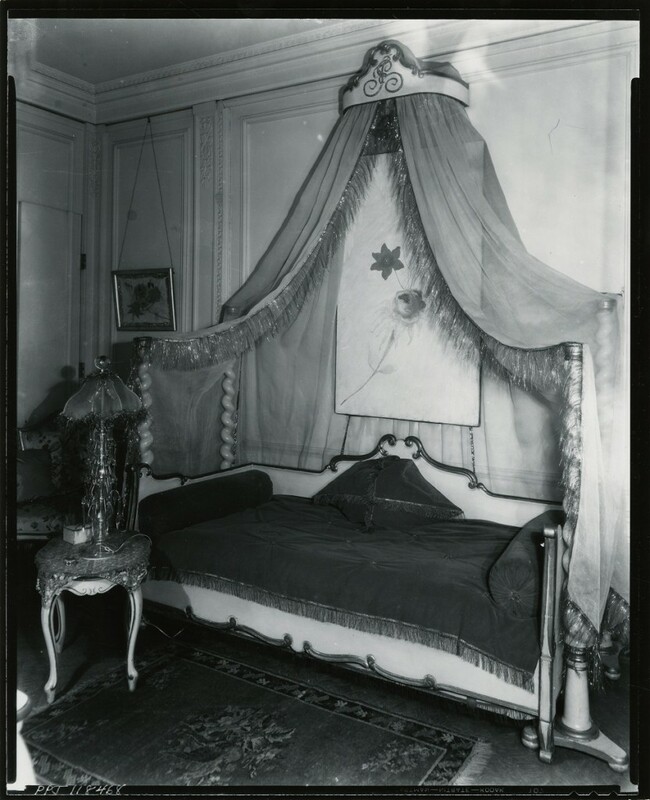 She covered the walls with white muslin and installed a canopy modeled on one she had designed for her own bedroom (fig. 4). Selling art in simulated private and semiprivate interiors was a well-established gallery practice in this period, and artists’ studios had long functioned as sites of display and purchase.13 Knoedler itself had privately shown art to its wealthy patrons in ostensibly domestic spaces without price tags, labels, or any other indication of commerce since the later nineteenth century.14 Stettheimer’s exhibition, however, transgressed even this highly fluid set of boundaries. 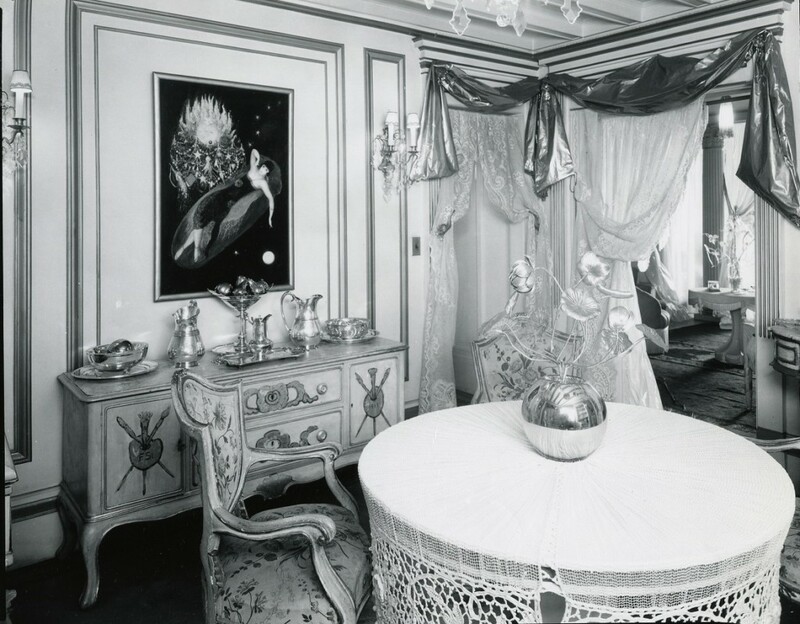 Recreating the most private areas of an artist’s own home, particularly a woman artist’s own bedroom, was far outside the norm. Fig. 4. 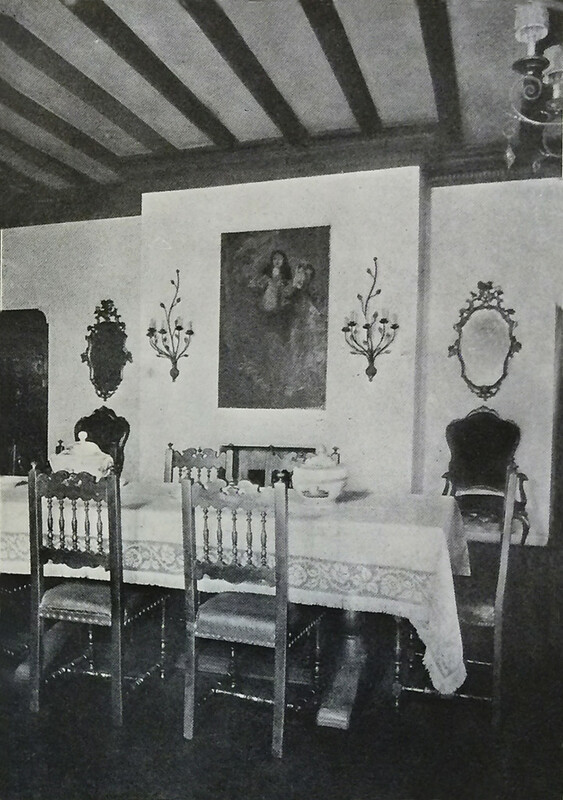 Peter A. Juley & Son, Interior of Stettheimer home, New York City. Peter A. Juley & Son Collection, Smithsonian American Art Museum, Washington, D.C. Following her one-person show, Stettheimer participated in between one and six exhibitions a year until 1926, when her mother became ill.15 The spaces in which she exhibited were extraordinarily diverse, ranging from museums to the annual exhibition of the Society of Independent Artists to department stores, including Wanamaker’s and, in one case, Marshall Field’s in Chicago. Following Stettheimer’s work through these varied locations allows us to map the ongoing circulation of objects and people in this moment. Fig. 5. 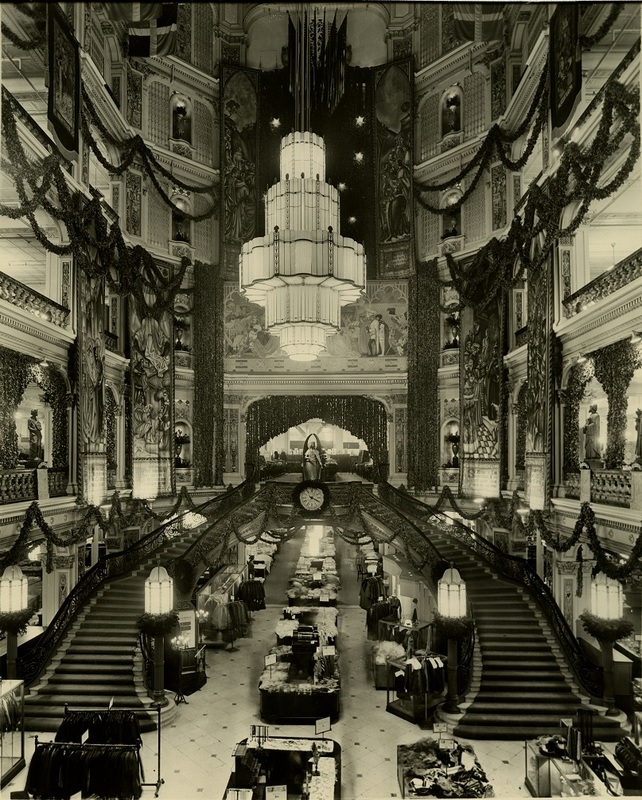 Wanamaker’s New York store interior rotunda with Christmas décor, photograph, John Wanamaker Collection, Historical Society of Pennsylvania, Philadelphia. In order to understand the Belmaison Gallery, it is also necessary to understand the specific department store in which it stood. In the latter half of the nineteenth century, John Wanamaker was one of the first men to create the department store as we know it today. In keeping with his evangelical Christian faith, he envisioned his stores as more than profit-making ventures. He saw them as venues in which to uplift the public through education, art, and culture, while also attracting and entertaining customers.29 As a consequence, although the Belmaison Gallery was atypical in that it exhibited modernist work, Wanamaker’s had been displaying fine art in both Philadelphia and New York for many years before the space opened. Fig. 6. Unknown photographer, Italian Room, 1920. Published in Belmaison Interior Decorations, John Wanamaker–New York, 1920. Much of what we know about Belmaison comes from a single document: a fifty-five page illustrated descriptive booklet published by Wanamaker’s shortly after its opening in 1919. This booklet makes it clear that Belmaison was explicitly designed by and for women.37 The department was the creation of Ruby Ross Goodnow (also known as Ruby Ross Wood), who had a long and illustrious career as a decorator and writer on the subject of interior design. Unlike its predecessor, House Palatial, Belmaison also included a staff of decorators offering custom interior design services. It was intended to stir the desire of housewives not only for luxury but also for self-improvement and self-actualization through consumption. The booklet explains that, by design, Belmaison “awakens in home-makers an idea of self-expression, a passion to make one’s home as beautiful as possible—realizing that in making our homes beautiful we go far toward making ourselves and our lives beautiful.”38 For most shoppers, the idea of living in the luxurious rooms of Belmaison would have been far out of reach, and strolling through them would have been an exercise in dreaming about a different life. Belmaison initially showed no sign of modernist influence and displayed no contemporary art. Its traditional style extended to the so-called Blue Galleries, a group of three rooms painted sea-blue and designated for the display of historical paintings alongside antique tapestries, carpets, screens, wallpapers, and furniture (fig. 8).40 With the opening of the Belmaison Gallery, however, modern art entered Belmaison. Fig. 7. Unknown photographer, English Hall, 1920. Published in Belmaison Interior Decorations, John Wanamaker–New York, 1920. Fig. 8. Unknown photographer, Blue Gallery, 1920. Published in Belmaison Interior Decorations, John Wanamaker–New York, 1920. 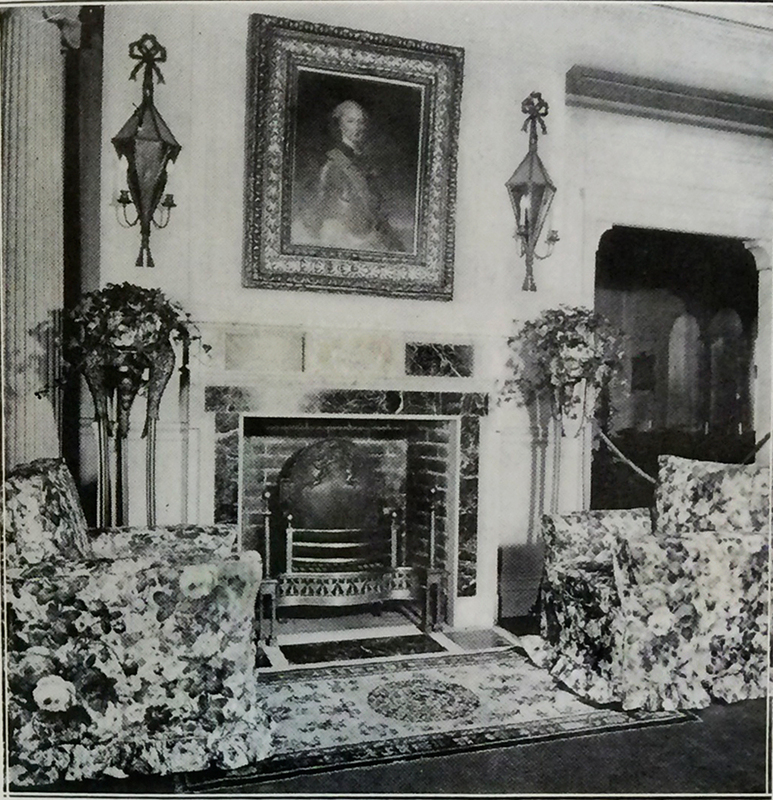 In the spring of 1921, the Belmaison Gallery opened in the rooms where the Blue Galleries had been.41 Nested within the feminized space of interior design, the gallery mounted a diverse array of exhibitions. These included everything from ambitious shows of postwar European modernism; to presentations of American modernist artworks with contemporary furniture, rugs, and ceramics; to exhibitions related to current events and containing no modern art at all. Previously unpublished archival material, including a collection of the gallery’s exhibition brochures now housed at The Metropolitan Museum of Art, demonstrates that these shows were categorized, promoted, arranged, and documented differently.42 Even within individual exhibitions, modern and decorative or popular objects were at times segregated into separate rooms. A detailed examination of the Belmaison Gallery reveals a multifaceted space of exchange and cross-pollination in which fine art, domestic décor, and popular culture intermingled.43 It also reveals, however, that the intermingling in this location resulted in the formation of intricate, implicit hierarchies. 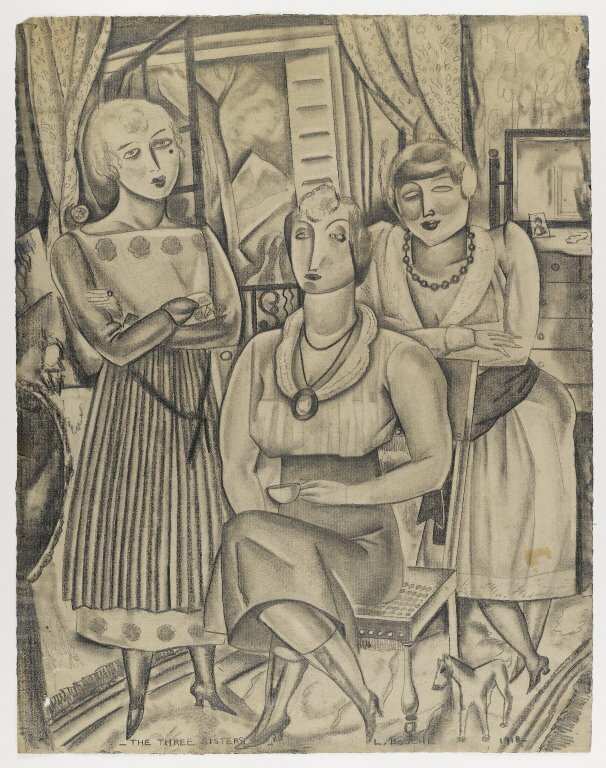 Louis Bouché, who became the inaugural gallery director in the fall of 1921, was a well-connected modernist painter, muralist, and writer whose primary interest was contemporary fine art. American by birth, Bouché grew up in France and the United States and as an adult spent considerable time in Europe. He showed regularly at major exhibitions in which Stettheimer also took part, including the 1921 Pennsylvania Academy of the Fine Arts show. He was a member of Stettheimer’s group, and though they were not particularly close, he had drawn a portrait of her with her sisters a few years earlier (fig. 9). She in turn painted Bouché’s portrait in 1923 (fig. 10), characteristically filling it with inside references. Among other elements, these include lace curtains, which appear often in both his and Stettheimer’s work and echo those in Stettheimer’s home.48 The curtains perhaps also nodded to the Belmaison Gallery itself; the gallery’s custom stationary included curtains framing the page. Louis Bouché, The Three Sisters, 1918. Graphite on paper, 24 3/16 x 18 7/8 in. Brooklyn Museum, Gift of Ettie Stettheimer, 45.121. Fig. 10. 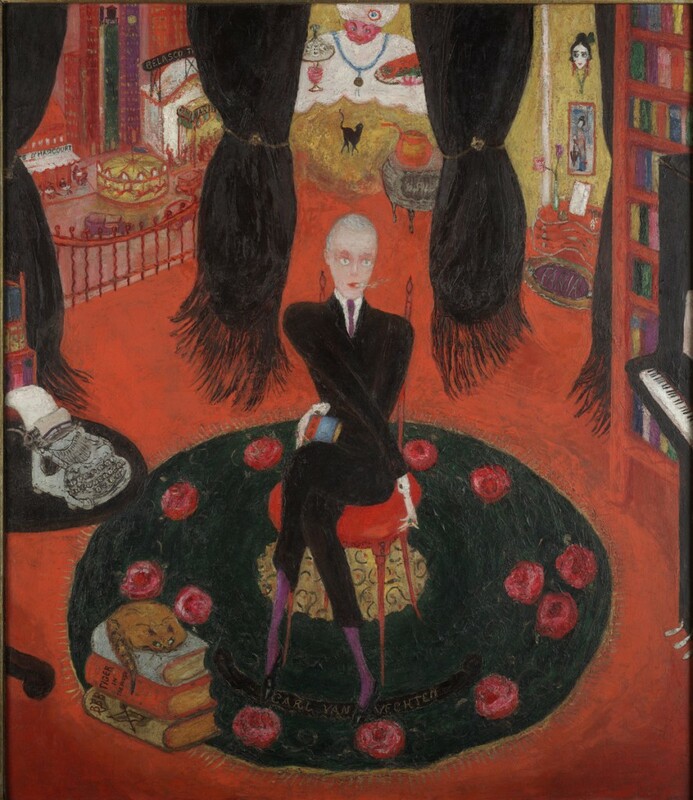 Florine Stettheimer, Portrait of Louis Bouché, 1923. Oil on canvas, 28 x 18 in. Heckscher Museum of Art, Huntington, New York. Following his opening salvo devoted to European modernism, Bouché’s shows fell into what he later described as two distinct categories: displays of cutting-edge modern art, with and without accompanying decorative works, and what he called “scene shows” based on current events. 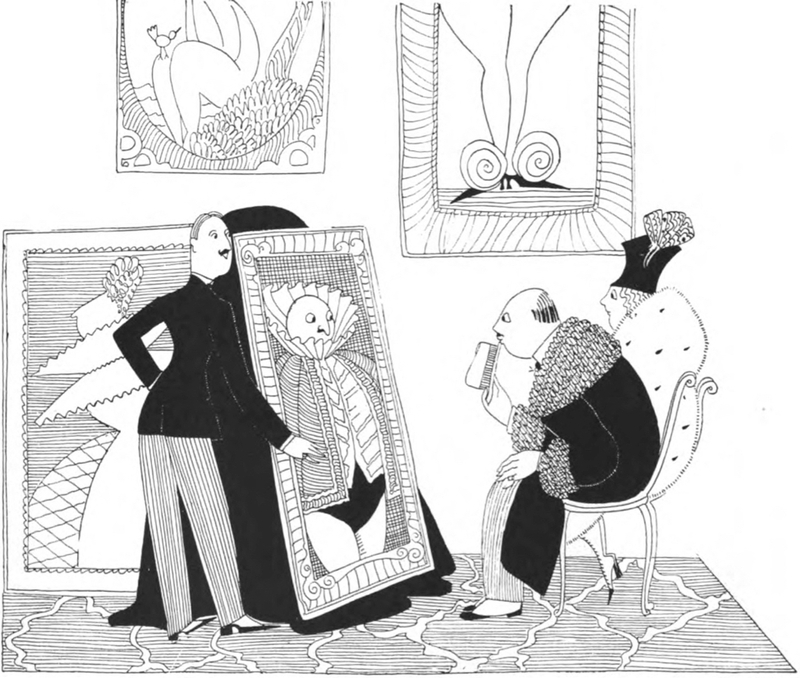 In his fine art exhibitions, Bouché displayed American artists including George Bellows, Andrew Dasburg, Arthur B. Davies, Stuart Davis, Charles Demuth, Preston Dickinson, Marsden Hartley, Edward Hopper, Rockwell Kent, Yasuo Kuniyoshi, Gaston Lachaise, Reginald Marsh, Walter Pach, Jules Pascin, Man Ray, Charles Sheeler, John Sloan, Niles Spencer, Joseph Stella, Maurice Sterne, Marguerite Zorach, and William Zorach. He occasionally added the work of contemporary European and Latin American artists to the mix. Bouché’s “scene shows,” which included no modernist pieces, drew instead on popular culture. For example, when the Prince of Wales visited New York for the International Polo Match, Bouché mounted an exhibition of art related to polo alongside mass-market saddles and bridles.52 Because the gallery consisted of multiple rooms, such displays could appear simultaneously. While these two kinds of exhibitions occupied the same spaces, the gallery only produced brochures for those that included fine art. The brochures themselves also demonstrate a different attitude toward what were clearly perceived as distinct classes of objects within those exhibitions. They commonly included detailed checklists of fine art organized by artist, but no documentation of other pieces. The layout of the gallery’s art exhibitions themselves also reflected this hierarchical approach. In 1923, Stettheimer participated in Bouché’s Exhibition of Paintings, Watercolors, Drawings, Etchings, Lithographs, Photographs and Old Prints of New York City, an unusually well-documented example of a show that included, but also separated, fine and popular artworks.53 The exhibition contained both modernist paintings by artists including Bellows, Hopper, Sheeler, and Sloan, and popular “old prints” of the kind traditionally used to adorn middle-class homes. Most of these prints, including several by the firm N. Currier (which would become Currier and Ives), date from the nineteenth century, but a few, such as a 1656 Dutch map with an inset showing “Nieuw Amsterdam,” were much older.54 Contemporary reviews describe five distinct areas segregated by medium and date, with three for modern paintings, one for modern works on paper, and one for the prints. The largest room displayed the most abstract depictions of the city, including the five sizeable panels of Joseph Stella’s Voice of the City of New York Interpreted (1920–22; Newark Museum).55 Bouché reproduced a modernist work by Bertram Hartman called City Blocks (c. 1920; Samuel P. Harn Museum of Art, University of Florida) on the cover of the exhibition brochure and, emphasizing the relative importance of the fine art pieces, listed the far more plentiful modern works first in a detailed list organized by artist. In contrast, the prints appeared in a crowded and heavily abbreviated chronological list in a second, smaller section of the brochure. The large number of objects—one hundred and thirty-five modern artworks and thirty-one prints—must have filled the rooms of the Belmaison Gallery to capacity, suggesting a crowded, salon-style arrangement with no room for object labels. Fig. 11. Angled photograph showing three-dimensional components of painting. Florine Stettheimer, New York/Liberty, 1918–19. Oil and mixed media on canvas, 60 x 40 in. Estate of William Kelly Simpson. Stettheimer contributed her New York/Liberty, illustrated here with an angled photograph that shows its sculptural components (fig. 11), to this diverse exhibition. Stettheimer’s work itself draws on a wide range of sources, mingling commercial, decorative, and modernist elements. These include a custom-made, carved wooden frame topped by an American eagle that quoted the contemporary fashion for folk art (a taste shared by members of her circle), and a three-dimensional Statue of Liberty adhered to the canvas. The subject of the painting is a specific and pivotal moment in the peace process at the end of World War I. In the foreground, President Woodrow Wilson stands aboard a Navy ship, likely the USS George Washington, on which he departed from New York Harbor for the Paris Peace Conference in December of 1918.56 Reflecting this time at which the nation stood at the tipping point between war and peace, the composition is split down the middle, with war and industry on the right and civilian life on the left. On the right, the Navy ship aims its cannons toward the viewer, with skyscrapers under construction rising behind it. In contrast, the welcoming Statue of Liberty is on the left, in front of the more residential West Side, where Stettheimer lived. This iconographical split is underscored by an equally well-defined binary color scheme in which blue and silver predominate on the right, and red and gold predominate on the left. This opposition of sparkling gold and silver on the two halves of the canvas is especially striking in person, because the pigments are far more metallic than they appear in reproduction. The painting is also a complex, repetitive amalgam of symbols representing the City of New York. In the upper portion of the painting, Stettheimer presents a compressed depiction of the island of Manhattan as seen from New York Harbor. Various city landmarks are both visually recognizable and repetitively identified with text. For example, the tallest skyscrapers, the Woolworth Building and the Singer Building (demolished in 1967–68), are topped with identifying flags reading “5 & 10 CENTS” and “SINGER,” respectively. Other well-known landmarks in the painting include Columbus Circle, Grant’s Tomb, and the neoclassical Federal Hall, complete with a tiny statue of George Washington. In the bottom center is a stylized rendering of the seal of the City of New York, with a colonist on the left, a Native American on the right, and a bald eagle crest above. The almost obsessively repeated symbols and landmarks fix the scene as inarguably New York, yet are also so prolific they begin to lose all meaning. For example, in addition to the overall red, white, and blue color scheme, the painting contains at least twenty-five American flags, with more suggested but not clearly defined (many are tiny and adorn various buildings and boats). Fig. 12. N. Currier (firm), The City of New York: From Jersey City, 1849. Lithograph, Prints and Photographs Division, Library of Congress, Washington, D.C.
Bouché’s juxtaposition of New York/Liberty with nineteenth-century prints representing the same subject matter, New York Harbor, underlines Stettheimer’s category-defying artistic practices by emphasizing the extent to which her painting both draws upon and transforms the visual conventions of older commercial illustration. 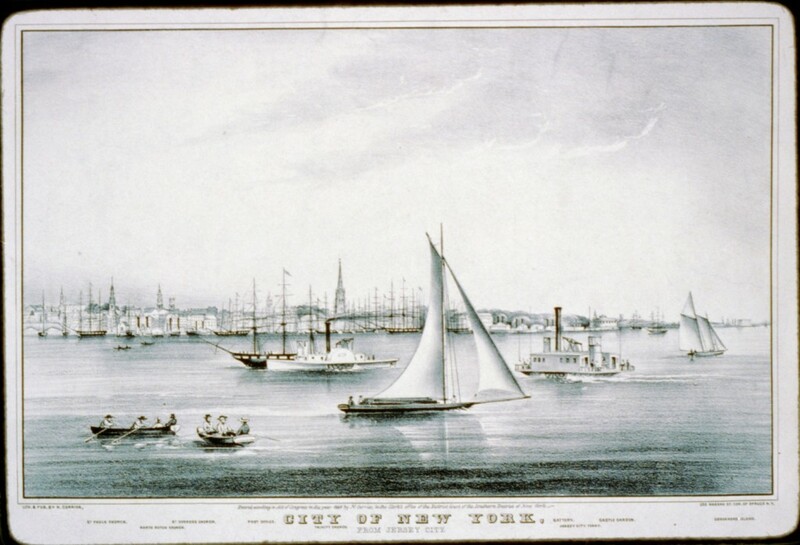 For example, the exhibition included the 1849 print The City of New York: From Jersey City, published by N. Currier (fig. 12). This commercial print shares important components with New York/Liberty. It too depicts travel by boat in the harbor, and presents the city as an amalgam of recognizable landmarks insistently labeled with text. The names of significant buildings or places in the image, including the post office, Trinity Church, and the Battery, are printed directly below them in the lower margin. 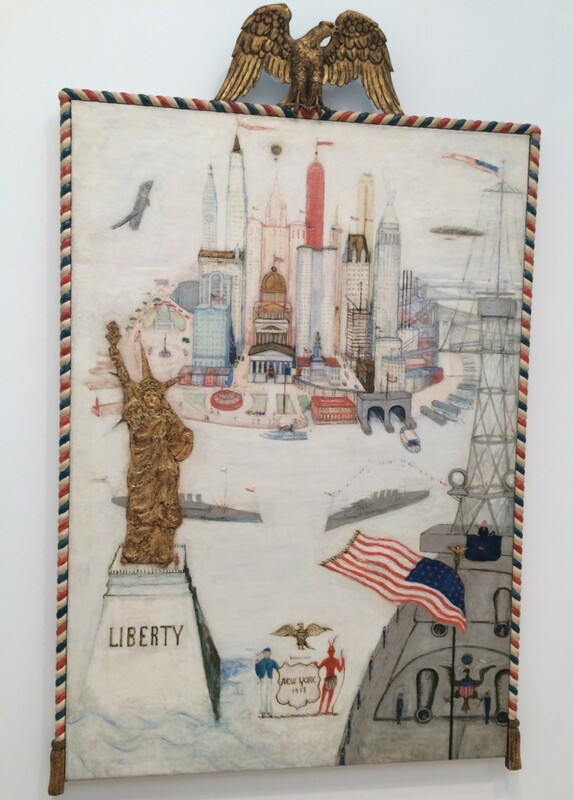 While both the print and New York/Liberty seek to map and label the city as seen from the harbor, Stettheimer’s composition uses a new, aerial mode of vision to create a more synoptic, modern vision of New York.57 In this way, the painting exemplifies the mixing of sources that characterizes both her work and the Belmaison Gallery as a whole. The Belmaison Gallery provides an important, unique, and previously unexamined example of a diverse yet differentiated display space in New York at this moment. It closed sometime in late 1925 and sold off its remaining inventory in early 1926. This was likely due in part to Bouché’s decision to leave Wanamaker’s in order to focus on his own artwork.58 However, the gallery’s placement of modern art in the department store continued to influence display in New York. 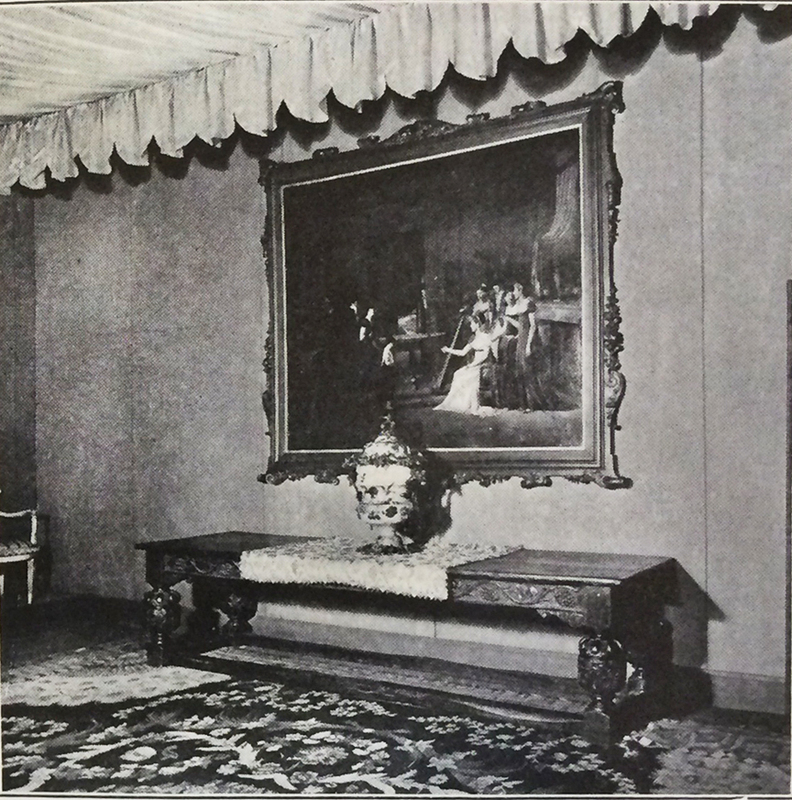 For example, in her large and ambitious 1926 Société Anonyme show, the International Exhibition of Modern Art at the Brooklyn Museum, Katherine Dreier included four smaller rooms partitioned off from the main galleries.59 These were outfitted with traditional furniture purchased from the large, middlebrow Brooklyn department store Abraham & Straus, and decorated with a variety of modern works by artists ranging from Louis Eilshemius to Kurt Schwitters.60 Dreier knew the Belmaison Gallery well, having purchased there a painting by Albert Gleizes.61 In Brooklyn, Dreier adopted the gallery’s commercial display strategy to a different end: advancing her noncommercial goal of bringing modern art into the homes and lives of people of all classes. When Stettheimer sent her modernist paintings to venues like the Belmaison Gallery, they entered the spaces of commercial culture. Her painting Spring Sale at Bendel’s, the other half of this equation, accomplished the reverse. It brought the complexity of a department store interior, with all its spectacular enticements, into a modern painting. Stettheimer’s 1921 painting Spring Sale at Bendel’s (fig. 1) and its 1922 exhibition at the Society of Independent Artists “no jury—no prizes” show together exemplify both the contemporary flow back and forth between art and commercial culture, and the complex distinctions operating within these overlapping categories. 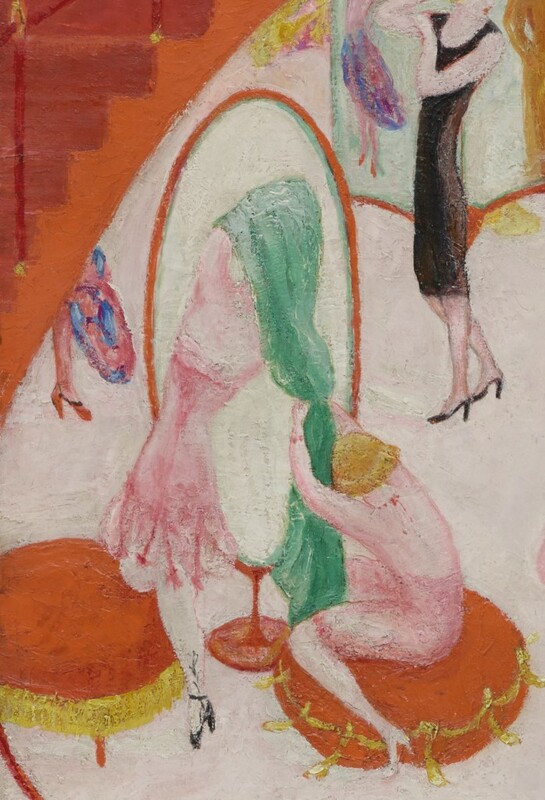 The store had once been the preserve of sophisticated couture customers, but by 1921 it increasingly attracted a wider range of women shopping for discounted or ready-to-wear fashion.62 In her painting, Stettheimer drew on a variety of modernist and commercial styles to map this increasing diversity, organizing the composition into specific spaces defined by class and gender. In 1922, she then placed this piece on view in front of a wide array of art world insiders, outsiders, and antagonists at the Society of Independent Artists annual exhibition. Florine Stettheimer, Spring Sale at Bendel’s, 1921 (detail). Oil on canvas, 50 x 40 in. Philadelphia Museum of Art. The compositional structure of Spring Sale at Bendel’s mirrors the social and architectural distinctions at the store. The largest and most detailed space of the painting is the central sales floor, framed by the red curtains and staircase. It is filled with budget-conscious shoppers of all ages driven into a competitive frenzy over the prospect of finding the perfect Bendel’s dress at a discount. Men stand outside the gendered boundary marked by the curtain and stairs on either side, occupying a second, liminal type of space. Stettheimer’s position looking down from above also evokes a third location, the upper floors devoted to wealthier customers. At the center of the painting, inhibitions drop as desire surges. Three women, one leaping through the air in her excitement, search through fashions spread out on a table. Others preen before a series of enormous mirrors, even, like the woman in the yellow dress at upper right, throwing off their clothes as if at home in their hurry to try on garment after garment. Women, like the figure in pink holding black lace at center left, move about half-dressed and showing their garters. The painting’s almost fluorescent colors and array of mirrors create a vivid, funhouse-like atmosphere that underscores the emotion and abandon on the floor. Extraordinarily bright oranges adorn upholstered stools, the edges of the staircase, and various garments. These are jarringly juxtaposed with strong contrasting colors. For example, Stettheimer places a line of pure green against pure orange on the edge of the oval mirror under the staircase (fig. 13). The painting’s composition is structured around and lit by a central mirror. As William Leach has shown, mirrors, already all but ubiquitous in department stores by the turn of the century, could provoke a kind of narcissistic haze in the consumer.70 Indeed, many women around the room seem entranced by them, evaluating their doubled, reflected selves as they construct a public identity through fashion and commercial consumption. Garlands of fabric, some flowered, also extend from the mirror in the center as if from a spring maypole. Women circle it, almost as if performing a joyful May Day dance. Stettheimer renders gender divisions explicit, as the only two men present stand in shallow, foreground spaces: one on the large red stairs at the left, and the other in front of the curtain on the right. Henri Bendel, guardian and ringmaster, is at the foot of the stairs between the bargain hunters and the more exclusive upper floors. Stettheimer knew him, and his store, well. She referenced Bendel’s both in her 1931 depiction of fashionable consumerism, Cathedrals of Fifth Avenue (The Metropolitan Museum of Art), and in her untitled poem describing a series of pleasures that reads in part: “I like oysters cold / and my garden with mixed flowers/ and the sky full of towers / and traffic in the streets / and Mallard’s sweets/ and Bendel’s clothes.”71 Stettheimer marks Bendel as the owner by placing him in an authoritative position outside the circus-like sale and crowning him with a laurel wreath disguised as a dress embellishment. She also references herself on those stairs. By painting her trademark signature, a lowercase “f” superimposed on an “s,” on the dog’s sweater, she both places a partial surrogate in the transitional space between upstairs and downstairs, and associates it with the instinctive nature of an animal. The vignette on the other side of the painting shows that, while men are confined to the foreground, Stettheimer presents a more complex depiction of gender than that division might at first suggest. There, an anonymous man offers his opinion on a garment to a saleswoman standing in front of the curtain and a female shopping companion hiding behind it. As others, including Susan Fillin-Yeh, have demonstrated, androgyny and sexuality were central concerns and recurring themes in Stettheimer’s work.72 The man on the right, like many in Stettheimer’s paintings, is clearly coded as a dandy in the visual language of the day. Dandies, commonly depicted with effeminate poses, sylphlike bodies, and tiny feet in contemporary cartoons, were a distinct cultural type in this period. They did not adhere to a common construction of masculinity, in which men were expected to be large, strong, and interested in rugged pursuits.73 Instead, they were understood as elegant, urban, fashionable, and often, to the right viewer, gay.74 The dandy Stettheimer places here represents an androgynous form of sexuality explicitly linked to fashion. The inclusion of Bendel also introduces homosexuality for those in the know; he was gay, and he had a long-time partner named Abraham Bastedo. Along with the sales floor and the foreground areas, the painting defines another space: the upper floor on which Stettheimer stands. She, and by extension the viewer, look down from the location in which couture fittings would take place and full-price garments would be purchased. Stettheimer’s relationship to the scene below her is complex; from above, Stettheimer depicts the spring sale below with a mixture of humor, superiority, and pleasure. Spring Sale at Bendel’s presents a humorous depiction of Bendel’s that both pokes fun at and celebrates the vibrant incursion of bargain hunters into this exclusive boutique. Stettheimer often painted in a simultaneously modernist and illustrative style, as her New York/Liberty demonstrates.75 Her portraits also owe much to the conventions of contemporary caricature, and her compositional strategies and sinuous women are indebted at least in part to the work of illustrators like Vanity Fair’s Anne Harriet Fish (fig. 14).76 She was not alone in this; many American modernists, including Demuth and Davis, incorporated aspects of popular illustration and advertisement into their work.77 Stettheimer, however, drew on another important illustrative source: couture presentation sketches seen privately only by wealthy consumers of custom-made fashion like Stettheimer, and unavailable to most artists of the day. 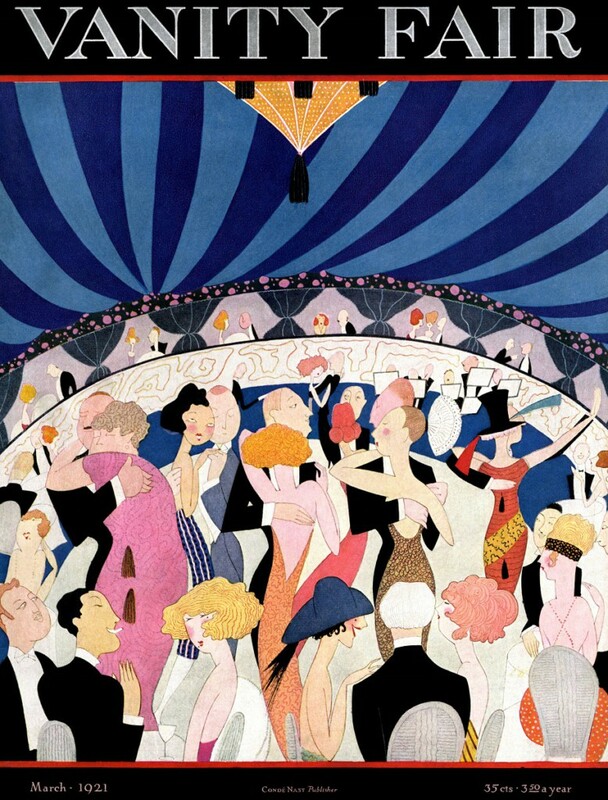 Anne Harriet Fish, Vanity Fair cover, March 1921. Conde Nast Collection, Getty Images. Anne Harriet Fish, Old Ancestors for New, published in Vanity Fair, July 1921, page 55. While Whiting and others have explored Stettheimer’s connection to published cartoons, the subject is particularly relevant to this painting. Stettheimer’s comedic depiction of the bargain hunters in the center of this composition references, but also transforms, images from a specific genre of cartoons: those commonly found in upscale periodicals mocking the poor manners of the rising middle class.78 The spectacle of a parvenu violating the code of manners in an upper-class setting was the premise of countless, often ruthlessly scornful illustrations. One such image is Fish’s Old Ancestors for New, published in Vanity Fair in 1921 in a feature called “A Collection of Collectors” (fig. 15).79 The cartoon and its accompanying text are merciless. The caption explains that these “crude people” are new millionaires from Racine, Wisconsin, quite literally trying to purchase the illusion of upper-class breeding by buying historic portraits to pass off as paintings of their own ancestors. In contrast to the art dealer, the husband and wife are pudgy and unfashionably dressed, and the hapless man betrays his poor manners by holding the brim of his hat to his lips. Unknown illustrator, couture design sketch with dressmaking notations, spring 1921. Henri Bendel Fashion and Costume Sketch Collection. Sketch HB 39-63. Brooklyn Museum Libraries Special Collections, Brooklyn Museum. Stettheimer also drew on an entirely different and previously unpublished set of illustrations. Bendel, like other couturiers, brought the high fashion designs he saw in Paris and other European cities back to his American customers in the form of one-of-a-kind, original watercolor and gouache drawings executed by a variety of hired illustrators.80 If a customer chose to purchase a dress, he marked that drawing with her name and personalized notations of her preferred colors, materials, and styles, guaranteeing that it could not then be presented to another client. 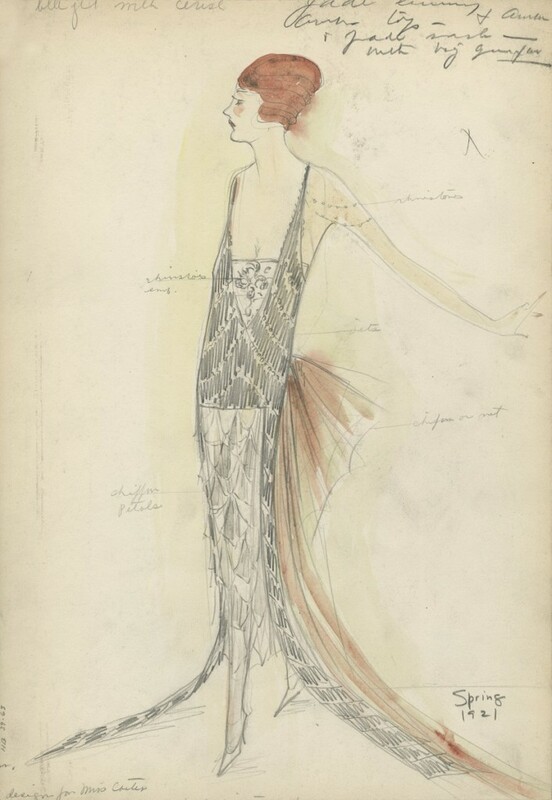 Bendel’s spring 1921 couture drawing inscribed “design for Miss Carter,” for example, includes handwritten pencil notations such as “rhinestones” at the shoulder and “chiffon petals” at the skirt (fig. 16). Even though it was sold at Bendel’s at the precise moment depicted in Spring Sale at Bendel’s, the spring of 1921, Miss Carter’s made-to-order dress could never appear in the pile of marked-down clothes at the center of the painting. Couture presentation sketches, in which women unfailingly stand perfectly poised and still, would have represented to Stettheimer, and the limited number of upper-class customers who also knew them, the antithesis of the bargain hunters in Spring Sale at Bendel’s. If Vanity Fair cartoons showed the upper-middle classes behaving badly, couture illustrations presented to fashionable upper-class women an idealized vision of themselves. While the women in Spring Sale at Bendel’s gesture wildly as they rush about, those in the couture sketches are dignified. There are, however, strong similarities between Stettheimer’s figures and those in the illustrations. For example, the woman in green at the very center of the painting, jumping through the air to grab a garment on the table, has the same lean, elongated body and tiny high heels as the woman in the sketch. This visual relationship between the figures in Stettheimer’s painting and those private illustrations, combined with the stark contrast in their decorum and behavior, again humorously posits a lack of manners as a defining characteristic of the upper-middle class. While Stettheimer’s illustrative sources illuminate the parody in Spring Sale at Bendel’s, the painting itself is no popular print or scornful cartoon. The influence of commercial images on Stettheimer’s art is undeniable, but her work stubbornly resists duplication. Stettheimer’s paintings are not reproducible products, and after her 1916 exhibition she characteristically did not offer them for sale. They are emphatically handmade, incorporating three-dimensional elements, custom frames, thick masses of paint, subtle layers of slightly-tinted whites, and glittering metallic surfaces (like those in New York/Liberty) that are still difficult to photograph. Stettheimer’s representation of bargain shoppers is also a complex, multifaceted modernist image that presents a nuanced depiction of the intermingling of classes, not a straightforward satire like Old Ancestors for New. The luminous scene and joyful, dancing movements of the women offer instead a riotous spectacle at once indecorous and fun. Little vignettes like the two women in pink at the left, one seemingly lifting a green dress off another, are humorous but not disdainful. Although the viewer is placed in a position above, and even superior to, the scene, the entry of these less wealthy, more uninhibited women into this elite boutique is also a source of interest and amusement. Spring Sale at Bendel’s engaged the laughter, both appreciative and derisive, that characterized the Society of Independent Artists exhibition as a whole. When Stettheimer submitted the painting, she gave up control over the objects with which it was seen. It became part of a motley assortment of 845 amateur and professional works. The painting was praised, with one critic singling it out as “alive with biting humor.”87 Yet who was being bitten? The cartoonish depiction of ill-mannered bargain hunters in the painting would have been recognizable to a broad public. Some audience members (perhaps including those inclined to keep their hats on) might have seen themselves in Stettheimer’s shoppers, conspicuous and out of place in a space where they did not know how to behave. At the same time, upper-class Bendel’s customers, particularly those select few familiar with couture presentation sketches, could have smiled knowingly at the joke. A focused examination of Stettheimer’s work, and the individual venues through which it circulated, reveals intricate hierarchies within a fluctuating world. Even standing side by side, viewers of various backgrounds could have wildly disparate experiences of what they saw. The Belmaison Gallery showed everything from recent work by Picasso to modern decorative art to polo saddles, while the accompanying brochures document that these objects were categorized differently. Museums collaborated with department stores to advance commerce, while modernist gallery owners attempted to draw a line between their enterprises and what they defined as crass mercantilism. The Society of Independent Artists presented exhibitions structured to open the art world to everyone, yet many outsiders left them bewildered, or even entered the space to laugh, thereby reinscribing a boundary between themselves and the avant-garde. Spring Sale at Bendel’s represents the joyful transformation by the bargain hunters of the first floor of the elite space of Bendel’s, yet it also maps the tensions that accompanied it. Examining and tracking Stettheimer’s paintings exposes implicit distinctions rooted in class and gender that complicate our understanding of the intermingling of modernism and commercial culture in this period. 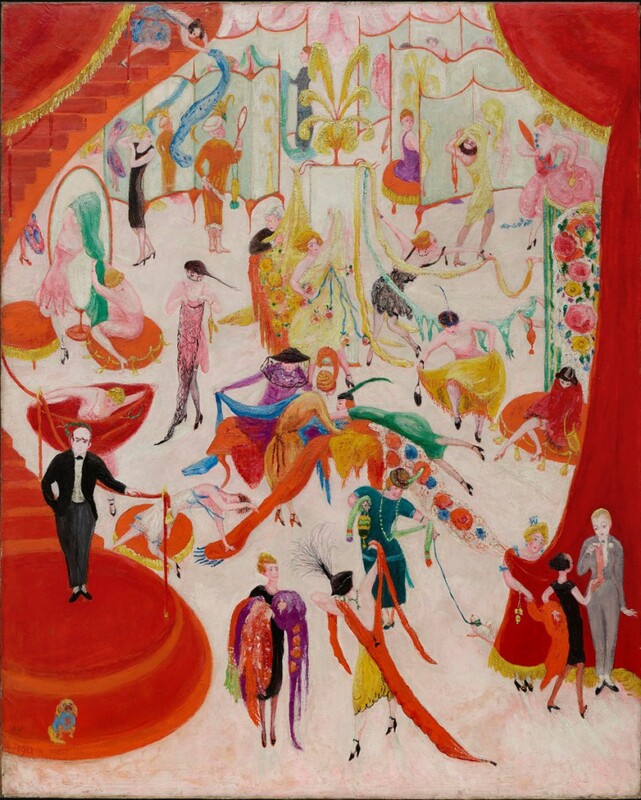 Cite this article: Heather Hole, “Florine Stettheimer, the Department Store, and the Spaces of Display, New York 1916–1926,” Panorama: Journal of the Association of Historians of American Art 3, no. 2 (Fall 2017), https://doi.org/10.24926/24716839.1604. About the Author(s): Heather Hole is Assistant Professor in the Department of Art and Music at Simmons College, Boston.